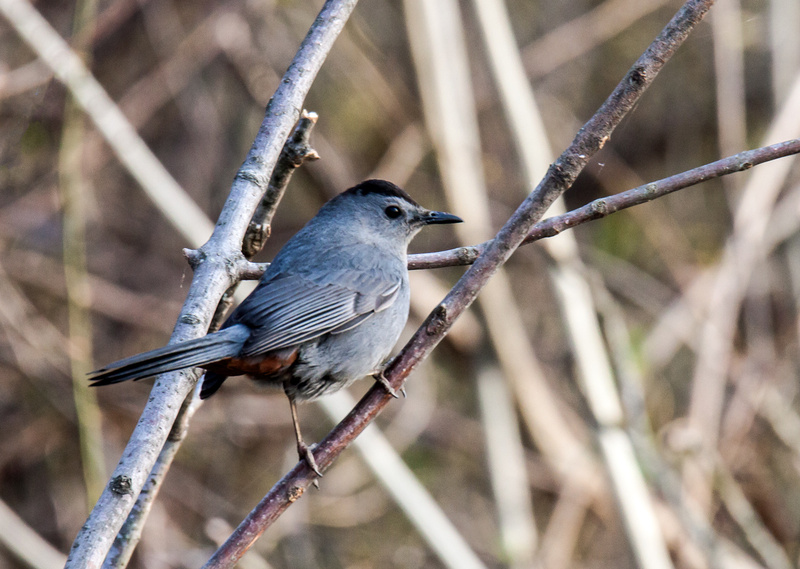 My bird books say that Gray Catbirds (Dumetella carolinensis), like this one that I spotted on Friday at Occoquan Bay National Wildlife Refuge, make catlike mewing sounds, which accounts for the name. When I initially heard this bird, it was making a variety of different sounds, none of which sounded like a cat, and I thought it was a Northern Mockingbird. It was only when I zoomed in and saw that the bird had less distinctive markings than those of a mockingbird that I realized that it was a different species. Catbirds do, however, belong to the same family Mimidae (also known as mimic thrushes) as Northern Mockingbirds and Brown Thrashers, like the one that I featured in a recent posting. Interesting post,Mike. It is interesting how expressions develop! Thanks, Chris. What’s funny for me is that we all use expression without really knowing where they came from or what they originally meant–I am as guilty as the most others. When you go searching for the origins, it often seems that even the experts have differing views. More than most languages, English has a reputation for being in a constant state of flux, with new words and expressions coming and going all of the time. I’m not sure that Benjamin understands about the expression, but he thinks the little bird is “sitting pretty”! He says that the “Catbird is cute. The Eaglets are still the bestest!” Thank-you, Mr. Mike!! We have anywhere from 3-5 cat birds that have claimed both of our palmetto trees home. They guard the bird feeders to regulate who and how much food each bird can eat. They don’t bother the squirrels though. They are ever vigilant. That’s cool to hear, Sally. I think that I have only seen a few catbirds ever, but I am seeing more birds all the time as my senses get even more attuned to nature. That’s a beautiful photo, Mike. I am always amazed at the birds that seek out that highest perch in a tree, sometimes balancing on what looks like a trig that barely supports their weight.